Having had regular sinusitis and recurrent sinus problems over the last few years, Catherine was bought an unusual birthday present last year. “My best friend treated me to some vouchers at the alternative therapy centre in Bristol to have a ‘Cleanse the soul’ experience, which included hopi ear candling. My friend had heard about this and was convinced it would clear out my ears and sinuses and make me feel so much better,” explains Catherine. 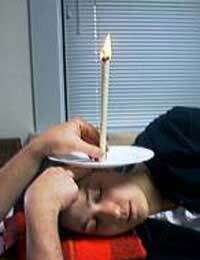 Essentially an alternative therapy that involves putting a special candle into the ear, while the person being treated is lying down on one side, and then lighting the candle and letting it burn down. As this happens, the warmth and the fragranced smoke goes into the ear and gently lifts out the build up of wax, relieving pressure and gently cleansing the sinuses. After the treatment, the air pressure between the nose, throat and ear is supposed to be reset back into balance, which helps any infections or inflammation in these areas. On the day of her treatment, Catherine spent a whole day at the centre. “When I arrived I had an hour to spend in the spa centre, swimming in the salt pool and using the steam room and Jacuzzi, then I wrapped up in my complimentary fluffy dressing gown and went down to the treatment centre,” she remembers. The next hour was devoted to a full body scrub, a massage for the lymphatic system and a full neck, face and head massage. “After all that, and with the gorgeous fragrant oils, I felt as though I was floating away, I was so relaxed. Then I was literally wrapped in something that was a bit like cling film, but it was a special body wrap to help the cleansing and moisturising process - apparently its really good for breaking down cellulite,” says Catherine. Once wrapped up, she was then positioned on her side and the hopi ear candle was placed carefully in her ear. “I became a human candlestick in a way,” she laughs. Keeping still was no problem as she was so relaxed, and Catherine found that she was not nervous about the candle burning away. “It really did feel good and my whole body felt warmed by the experience,” she describes. After the first candle had burned down, Catherine turned over and the process was repeated in the other ear. What are Hopi Candles Made From? The candles themselves are no ordinary candles - they are made from a mixture of bees wax, soya extract and an absorbent muslin fabric. As it burns, the ear is filled with warm and fragrant smoke that helps to loosen the wax in the ear, gently lifting it away as it is taken up by the muslin. What Did Hopi Ear Candling Feel Like? “I really enjoyed it at the time - it was a really relaxing, almost spiritual experience and I loved it. Afterwards I did notice a difference and, the next morning, I woke up with no headache for the first time in months,” says Catherine. She was so impressed that she booked three more sessions within a week of her ‘soul cleanse’. “I couldn’t quite run to the expense of that every time but I definitely wanted the Hopi ear candling again and, after one treatment a month for the last 6 months, I haven’t had any more sinusitis, so I am really happy that I went,” she says.